Power has been restored to remaining homes affected by Storm Caroline. The storm caused widespread travel disruption in northern Scotland with gusts in excess of 90 mph recorded. Scottish and Southern Electricity Networks had stood down repair teams for safety reasons overnight. Orkney and Shetland were the last places affected by the power loss. All schools in Orkney and Shetland were closed on Friday, along with dozens in Aberdeenshire and the Highlands. About 50 were closed across Aberdeenshire, and other pupils in the area had their school transport cancelled due to problems with snow and ice. 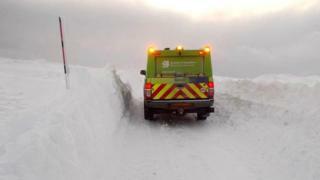 The majority of Highland closures were in Caithness and Sutherland. There were also schools closed in Easter Ross, Wester Ross, Lochalsh, the Black Isle and Strathnairn. Forecasters have warned that parts of the UK, including northern Scotland could see more snow fall on Saturday. Drivers have been warned to be careful on snow and ice-covered roads. Passengers had to spend Thursday night on board the Orkney ferry Hamnavoe after it was unable to berth in Stromness after sailing from Scrabster. The NorthLink Serco vessel was escorted by a tug to Scapa Flow, and managed to dock on Friday morning. Passenger Jamie Robson - who was to be appearing as a pantomime villain on arrival - told BBC Scotland's Good Morning Scotland: "We were almost within touching distance of the pier but the winds were too bad. It was pretty choppy." SSEN said it had restored electricity supplies to 18,000 customers who were affected by the storm. The main areas affected were the Western Isles, north-west Highlands, Caithness, Moray, north-east Aberdeenshire, Orkney and Shetland. The Coastguard helicopter from Sumburgh was deployed to take two engineers from Kirkwall to North Ronaldsay to help restore power. Director of customer operations Dale Cargill said: "Our network generally stood up well to Storm Caroline and I would like to thank all our customers who experienced a power cut for their patience as we battled against the elements to restore their power. He continued: "We have now returned to business as usual but we will continue to monitor conditions and are well prepared to respond to whatever other challenges the Scottish weather has in store for us this winter." Saturday's Scottish Championship match between Inverness Caley Thistle and Falkirk has been postponed due to the snow. At Peterhead FC, the club appealed for volunteers to help clear the pitch of snow ahead of its game with Clyde.